Authors aren’t supposed to have favorite book projects, or so I’ve heard, just as a mother’s expected to not profess having a favorite kid. And of course I do have a special affection for all the books I’ve worked on over the years. But just between you and me, Salty Snacks was a particular favorite. Not only was it a chance to dive head-first into a category of food I most crave — salty-crunchy things (in the long run including not-so-crunchy items as well) — but also an arena that proved to be great fun on the creative front. When I started that project it was a wide open slate with a few foundational points of departure: chips, crackers, popcorn, nuts. And within those classic categories I did some fun explorations, including carrot & parsnip chips, fennel-orange crackers, caramel-masala popcorn, mixed nuts mole. But from there, it just got more and more interesting in my kitchen. Salted popcorn meringues and five-spice duck skin. Cornbread-chile biscotti and sichuan pepper apple chips. I was having a ball! One mini-category of recipes was particularly inspiring, taking cookies into the savory realm. I worked up a thumbprint cookie using Parmesan dough and a tomato-tart cherry jam filling. I whipped up a dark chocolate cookie accented with oats and topped with a sprinkle of brown sugar and salt. And this recipe below, which became a favorite of mine in the book. I almost never bake cookies, we’re just not a cookie-eating household, neither of us much into sweet snacks. But as an avid peanut butter fan, I’ll pick up a peanut butter cookie as an indulgence now and then. So playing around with that childhood favorite was great fun. Not sure the motivation, but I cooked up a batch yesterday. It’s a particularly aromatic recipe, beginning with toasting cumin seeds, coriander seeds and sesame seeds as the base of the dukka spice mix that coats the cookie dough before baking. 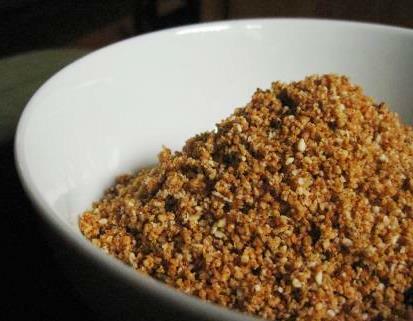 Dukka (also spelled dukkah and duqqa, among perhaps other variations) is a Middle Eastern nut-based seasoning mix. Peanuts not typical, more often it’s pistachios or hazelnuts. Here it adds a flavorful, nutty texture to the cookies, which themselves have a surprising dose of heat from red pepper flakes. These look pretty much like a traditionally-sweet peanut butter cookie—so it’s up to you whether you warn your friends about its savory, spice-enhanced flavor before they bite into it! For the dukka, combine the sesame seeds, cumin seeds and coriander seeds in a small dry skillet and toast over medium heat until the sesame seeds are just lightly browned and the other seeds are aromatic, 2 to 3 minutes, tossing occasionally. Transfer the seeds to a food processor and let cool for a minute or two, then pulse a few times to partly grind the seeds. Add the peanuts and pulse until they are finely chopped and well blended with the seeds (avoid over-processing or the mixture might turn to a paste). Add the paprika and salt and pulse a few times to blend. Transfer the dukka to a shallow bowl and set aside. Preheat the oven to 350 F. Line 2 baking sheets with parchment paper or silicone baking mats. Stir together the flour, baking powder, salt and dried chile flakes in a medium bowl. Stir together the peanut butter, butter and brown sugar in a large bowl until well blended. Stir in the eggs, one at a time, beating well after each addition. Add half of the flour and stir until incorporated, then stir in the remaining flour to form a smooth dough. Pinch off some of the dough and roll it between your palms into a ball about 1 1/4 inches in diameter. Roll the ball in the dukka to evenly coat it and set the ball on the baking sheet. Repeat with the rest of the dough, arranging the balls about 2 inches apart. Use the bottom of a glass to flatten the balls to about 2 inches in diameter, twisting the glass a bit as you lift it up to help avoid sticking. Bake the cookies until aromatic and firm to the touch, 18 to 20 minutes, switching the baking sheets halfway through. Let cool a few minutes on the baking sheets, then transfer the cookies to a wire rack to cool completely. 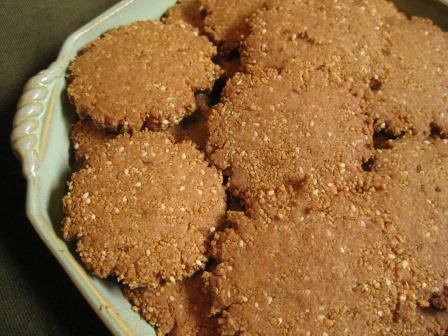 Arrange the cookies on a platter or plate for serving, or store in an airtight container for up to 3 days.